We spend a significant portion of our lives at work and therefore contribute a good share of our energy to our careers. It goes without saying that consistent performance is important to being successful professionals. Sometimes, work is demanding and draining. So how can we maximize the excitement and joy in our professional endeavors, while minimizing the stress and pressures that come with our job responsibilities? The answer: Many professionals are finding help in mindfulness. A lot of brain power goes into being a successful professional. In order to keep things flowing in a positive direction, it’s important to strive for mental clarity and understand the science of stress. You can gain such insights through mindfulness. Mindfulness builds your emotional intelligence (EI) by strengthening mental resilience, building a clearer mind and allowing you to embrace a happier inner self, thus creating a brighter outlook. Strengthening your EI and raising your self-happiness translates to better confidence, improved communication skills and greater interpersonal relationships. Practicing mindfulness is not the goal in and of itself, but rather a means to reach your goals. Numerous studies have shown changing one’s inner landscape (e.g., your values, emotions and thoughts) through brain fitness can free the mind of anxiety, pressure, and negativity. Remove this mental clutter and replace it with greater EI and you’re left with enhanced creativity, greater aptitude for thinking and a better ability to stay in the present. For business professionals, having a clear, balanced and focused mind can be a tremendous asset. Possessing these traits allows you to produce high-quality work or meet new goals for your organization. When you make mindfulness part of your routine, you become more efficient in business. But where do you begin? First, keep it simple. Start by incorporating a few new habits a day. Here is an action plan to help you begin the journey to mindfulness. Engage in weekly 15-minute onsite or online mindfulness sessions to increase mind and body awareness. Allocate time in a designated quiet area to perform meditation, breathing, and relaxation exercises to reset yourself during a busy day. 1. Be proactive: Taking action will help you achieve self-mastery. Begin with an end in mind: Working to achieve an end-state helps you move from dependence to independence. 2. Put first things first: This enables you to prioritize items by importance. 3. Think win-win: This strengthens your ability to work with others. 4. Seek first to understand, then to be understood: Doing this allows you to become more empathetic, setting the stage for a more positive environment. 5. Synergize: This helps you become a better teammate and achieve goals in tandem with your colleagues by seeking out differences and using creative problem solving. 6. Sharpen the saw: Doing this allows you to play to your own as well as other’s strengths, thus improving health, energy and mental renewal. Research has shown when you make time for silence and focus your awareness on the present, you improve concentration, creativity and your ability to focus on the task at hand. 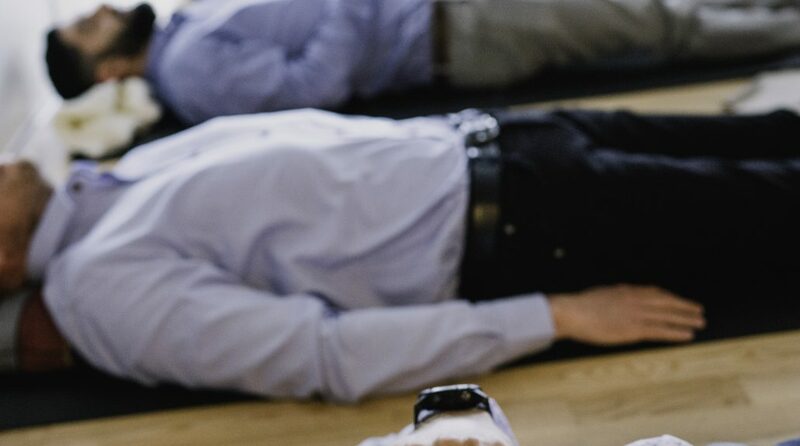 Start all meetings, both online and onsite, with a personal moment of silence to land, focus and connect. Put your worries, past meetings, stress, drama and moods aside. Having a rudimentary understanding of mindful techniques and the science behind them increases your ability to concentrate on the task at hand rather than day dreaming about a project (or a vacation) six months down the road. We’re all busy with work and life, and time is one of our most precious assets. Taking time out of your busy day for mindfulness might seem inconvenient, but when you consider how much more productive, balanced and positive you can be at work and home, it’s hard to not to make mindfulness a priority. Would you like to try out mindfulness? If so, we offer a free weekly mindful recharge training session online. Visit here for more information. Anne Krog Iversen is the Co-Founder and Chief DNA & Culture Officer at TimeXtender, where she built, implemented, and manages corporate mindfulness throughout all of its global offices and has made it an integral part of the company’s DNA. She has played an instrumental role in growing TimeXtender across numerous geographic regions and attracting more than 3,000 customers worldwide.